In Siberia you can find a unique architectural ensemble that is a testament to the region’s glorious past: wide staircases, intricate wood-carved window frames and roofs covered in Siberian “lace.” RBTH shows you the best of old Siberia that a small town of Tomsk has to offer. One can see the masterpieces of wooden architecture while walking through the streets of Tomsk (2877 kilometers from Moscow). This city is widely considered the top city to take in wooden architecture in Siberia and learn something about this region’s aristocratic past. Since the 17th century wood has been the most affordable and thus favorite building material in Siberia. In addition to peasant huts, cradles, dishes, boats, winter sledges, spinning wheels and weaver looms were also made out of wood. These wooden works embrace the idea of beauty embodied by generations of Siberia residents. Tomsk is small and cozy and its main sights can be seen in one day. Start your walk at the Museum of Wooden Architecture where you can become acquainted with the history of local “lace” architecture. The museum – the house of Andrei Kryachkov (Prospekt Kirova 7) – is also a local architectural landmark. This house is unique as it was the first building in Tomsk constructed in the then fashionable style of Art Nouveau. The exposition features examples from wooden houses and other carved decorations, as well as household items made of wood with examples from over the last 100 years. Unfortunately, many wooden houses in Tomsk have been destroyed by fire over the years, therefore many museum exhibits here represent rare architectural connections to past epochs. Please note that historical properties are often referred to simply by their features or design. 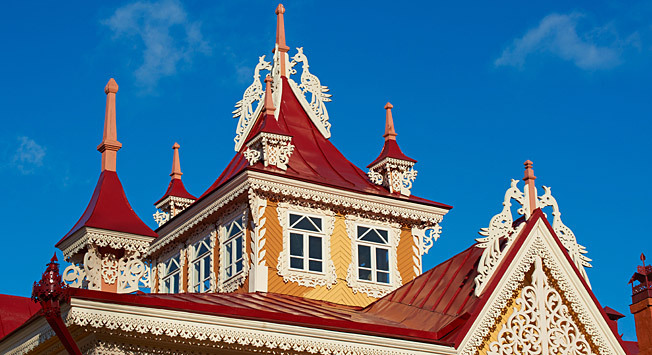 One of the most amazing wooden landmarks of Tomsk is the House with Pavilion found at Krasnoarmeiskaya ul. 71. In 1910 it was built by local architect Stanislav Khomich for the famous merchant Georgy Golovanov. This house has served numerous functions over the years. After the revolution in 1917 it served for a while as a sanatorium for mentally ill children. Then during World War II evacuated children were placed here, becoming a medical school after the war. In 1993 the Center for German Culture began restoring the mansion. Today the house with the pavilion is home to the Russian-German Society of Tomsk, which brings together Russian Germans from throughout the Tomsk region. Before restoration Golovanov's mansion was a simple white building with a red roof. Historians have stated that the building “looked European and stood out among the background of other buildings of the residential quarter.” Today the house is painted delicate white and light blue, which suits the building very well. In my opinion it resembles a delicate knitted scarf with lace and numerous ornaments. It’s an irresistible image that stays with you. The house exteriors and interiors remained well preserved with the doors and plaster rosacea patterns on the ceiling embellished by wooden and stone reliefs. The House with Firebirds at 67 and 67a Krasnoarmeiskaya ul. is part of the former estate of merchant Leonty Zhelyabko. The legend has it that a colorful little “terem” (wooden palace) in the estate's yard was built for the merchant's daughter as a wedding present. The luxurious and at the same time simple construction here combine the forms of Russian national wooden architecture and carving with elements of baroque. Today its residents are average people who dine most evenings near a bow window with carved frames. Most of the interiors are original and nearing 100 years old. It is hard to pass by the Art Nouveau House with Dragons at Krasnoarmeiskaya ul. 68 and not notice it. Local historians say that while working on it the architect Vikenty Orzheshko was inspired by several buildings. The first was the Borgund Stave Church in Norway (1150-80). One of the oldest existing frame churches, it also features dragons on its roof. Another major influence was the Romingten hunting lodge in East Prussia that belonged to Wilhelm II. Today it can be found in the Kaliningrad Region. Guided tours around Tomsk in English, French, German and Chinese can be arranged through Tomskturist. One can book a basic guided tour around Tomsk or a more focused tour on wooden architecture or the city's architecture in general. Individual tours are 4500 rubles (about $68 plus additional transport costs), with significant discounts if you are part of a large group. Contact them by email. Students at Tomsk State University have compiled a guide for their fellow students from abroad that offers some tips and insights on local life. There are regular flights to Tomsk from Moscow or St. Petersburg (15 000-20 000 rubles, $230-300). From Novosibirsk there are buses leaving almost every hour to Tomsk. Tickets cost 700 rubles (about $11) and the journey takes about four hours. The bus from Krasnoyarsk takes about 10 hours with tickets costing 1300 rubles ($20). At home: What does everyday life look like in Siberia?